Date: 30 Tos. 961 A.T.
As the pair watched the three remaining archeologists and ethnologists go from the remains of one building to another, one of the pori had been in one place for quite a while while the other two had come and gone between several buildings. Mik went to investigate. Inside he found no pori after asking several times, but a rustling of rocks and metal that would not subsist. The three remaining pori quickly scrambled together, trailed by the diminutive Mik and now two of the large daekoiz. Unable to catch up with the pori, he quickly scrambled up to the top of a building, only standing a couple meters higher than the daekoiz on its hind legs. 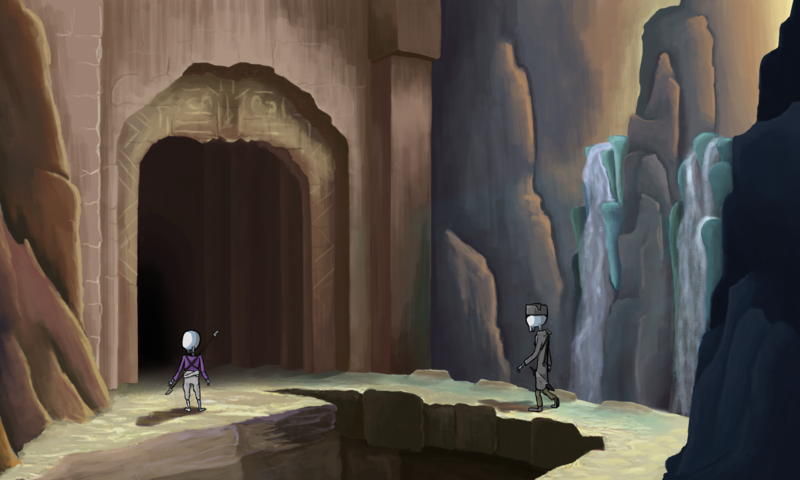 Both of the creatures continued to chase the pori around the largest vent in the center of town, seemingly buying time until Mik could figure out how to defend them. In a rash burst of confidence, Mik jumped off of the building and landed in front of the pori, motioning them to continue running and to get on top of the building he came from. Quickly, he pulled his double voulge out, attempting to slash across the face of the first daekoiz he met. Unsuccessful, he began backpedalling while he pulled out his two pistols, firing them off as quickly as he could. This startled the creature enough to force it back on its smaller hind legs. Mik took this opportunity to thrust at its plated underbelly, staggering it backwards into the other daekoiz. Both tumbled into the crater and let out terrible shrieks as they burned alive. “Where are we even going?” Mik was confused, but complied nonetheless. He trusted Alhicj. Mostly. “How are Poria at climbing?” Mik was fairly adept at climbing, but this angle would be rough, hanging nearly upside-down at certain spots before reaching the exit. As the magma began to audibly bubble and hiss with the dissolution of the daekoiz, another pair emerged from the ground. Now sprinting, Mik demanded answers from Alhicj, who was the only pori keeping pace with his pace. “Alhicj! The research journal must be delivered!” The third pori was falling behind, as Mik looked he was noticeably dimmer, the volcano’s magma had not responded well within his body. “Do not worry!” Alhicj produced the journal in the hand he had not removed plates from before quickly returning it back amongst his garments. Turning and running again with Mik, he continued. “Daekoiz can hibernate for hundreds of years, keeping their rock plates tight to their body to retain heat, and open them again when they are awake. Like Poria, they consume molten material to survive, but they cannot touch it. The insides of their bodies are much tougher than the outsides, which is why they prefer smaller pori, who they can eat whole.” As they reached the side of the mountain, the two remaining pori had fully molten hands and feet, thrusting them into the side of the mountain much like how Mik would climb a glacier with ice picks and pointed boots in Pale Shores. Well, if he wore boots. “Don’t you have any sort of defense against them?” Mik now climbed in their indentations along the wall. They were right, this was no problem at all for him. Still, he kept his head turned, watching for the Daekoiz to follow them up the wall. Just as predicted, within a few minutes they were climbing from the mountain, and after a few minutes more they were near the top, looking over the mountain at their camp on the other side. With no pirates in sight, and Astran beginning to disappear over the horizon behind them, the now-trio began their journey back to their ships. It would be an hour’s journey. Just as long as they had taken from the ships to camp, but this time they could walk faster without that equipment, which made up for the increased distance. Shortly after most of the light from Zisdhalilci faded, the two pori went into their ship, disabled the electricity and Mik got on his. Shortly after detaching the metal cable, that too was returned to the research vessel, and Alhicj came out carrying something small. He motioned for Mik to come to the railing of his ship. Once there, the pori tossed the small item with a good amount of force just over Mik’s head, where with a jump and outstretched arms he was able to grab the item. The familiar jingle of Lott in a pouch greeted Mik as his hands closed around the coins, and he walked back to the railing. “Unfortunately for you, I have to return to our research institute immediately with this data. When I can contact you, your ship will have a beacon. I remember your frequency quite well.” With that, Alhicj bode farewell and returned to the ship, which took off rather quickly.